On the surface, the Bobby Petrino saga is not a complex one: The man wiped out on his motorcycle while shuttling his 25-year-old mistress, a woman he’d recently hired and had allegedly gifted with $20 grand in cash. And then he lied about pretty much everything. It is a scenario far too preposterous for the pages of a Dan Jenkins novel, and it is in keeping with the public narrative of a man who has seemingly never been above resorting to the bald-faced lie. He did it in Atlanta, when he told the Falcons he was staying and then bolted for the Arkansas job while the mimeograph was still cooling; he did it when he interviewed for the Auburn job before one of his ex-bosses, Tommy Tuberville, had even been fired. And so there is nothing surprising about how this courtship ended. 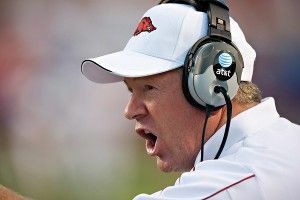 Long comes across more as a carnival dupe than a paragon of integrity, and Petrino’s wipeout at Arkansas just reinforces the fact that most football coaches have at least a little bit of untethered assholishness in them (see: Williams, Gregg, et al.). Here you are, trafficking in controlled violence, selling your school to 17-year-old kids while subtly disparaging your competitors; the whole process is grounded in manipulation, and I’m certain Long recognized that, and saw in Petrino his best opportunity for a winning football team, which is what the fans and the alumni base demand in the Southeastern Conference. If Petrino had cheated on his wife without involving the university hiring process, nobody would have given a damn, and that’s probably the way it should be. We’ve all had great teachers who were morally questionable human beings; a person can be a jerk and a leader at the same time. I’ve learned a lot of valuable lessons from assholes. In fact, there’s something kind of refreshing about the fact that Petrino’s assholishness was so in-your-face: He was a scoundrel when he was hired, and he was a scoundrel when he was fired. It doesn’t make him any less of a football coach. It may have even been what made him a great coach in the first place. Can the Sixers' Middle-Class Dream Be Saved?